400p. bibliog. glossary. index. notes. photos. Grey House. Aug. 2018. Tr $195. ISBN 9781682179512. 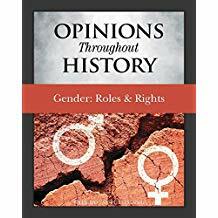 Gr 9 Up—Beginning with a discussion of the patriarchal system in colonial America in 1777 and ending with an examination of the #MeToo movement in 2018, this work provides an insightful analysis of gender issues and public policy throughout history. Six sections cover constitutional rights, sexual nonconformity, workplace issues, LGBTQ rights, birth control and reproduction, and marriage and parenting. Each chapter uses a primary or secondary source to examine an aspect of the subject, with Issit offering commentary and discussion questions. Also featured are historical snapshots of events from 1793 to 2018, footnotes, a detailed overview, and a historical time line from 1533 to the present. Unfortunately, the black-and-white illustrations, consisting of photographs and documents, are weak, and some of the supplementary material could have been condensed. VERDICT The author effectively explores the complexities and controversies of the topic in a way that high school students will find accessible. Consider where primary and secondary source documents are needed.